Here at the Skepchick network we love using magical creatures as an excuse to talk about biology. I did it at TS with Tolkien’s giant eagles, Mad Art Lab did it with dragons, and, because it was so much fun, I’ve decided to run with it and start a series of posts about the biology of mythical creatures called cryptophile. Why? Because biology is awesome, and so is folklore. For the few of you who don’t already have a mental picture of our first creature in this series, a griffin is a chimera of sorts. It has the head, front legs and wings of an eagle, and the back legs, body and tail of a lion. They feature in Warcraft, under a different name in Harry Potter, and on heraldry and in myth throughout the West. Images of griffins began appearing, in the archaeological record at least, over 5000 years ago, and were a common feature in Ancient Greek art. There is a pop theory out there, though in my brief research on this topic I could find little solid evidence of its validity, that the legend of the griffin originated from the discovery of Protoceratops skeletons preceding the discovery of the dinosaur, and even the concept of extinction. Finding a skeleton, our ancestors may have thought, must surely mean this creature lives, somewhere in the world? Protoceratops was part of a group of small, horned dinosaurs, related to and resembling Ceratopsians such as Triceratops. These herbivorous dinosaurs lived in the Cretaceous, the last period where dinosaurs lived, and the period directly following the Jurassic, and, at first glance and without common knowledge of dinosaurs and the concept of biological extinction, the four-legged animal with a beak could seem like an oddity. Dinosaurs are not the only vertebrates besides birds to develop beaks, however. Turtles have beaks of sorts, and though not the same, the bird-like bill on a platypus does suggest that mammalian beaks are not an impossibility. Certainly the evolution of birds itself suggests that toothed creatures can eventually develop beaks? But what of the griffin’s feathers? Feathers, as we see them on the griffin and in modern birds, are extremely complex structures that have been refined over millions of years for insulation, flight, display, and in the cases of ducks and other water fowl.. well, think of the phrase ‘like water from a duck’s back’ and you get the picture. So what are the main features that hold the griffin back from being biologically plausible? Well, the major hurdles to to create a griffin, would be its feathers, and its six limbs. In a lab, it would not be impossible, in the far future, and with a better understanding of all the genetic pathways that make up feathers, to give feathers to a mammalian creature, such as the griffin appears to be, along with its bird-like front feet. However, in the natural world, coming up with exactly the same solution, when the end result is so complicated, is very unlikely. 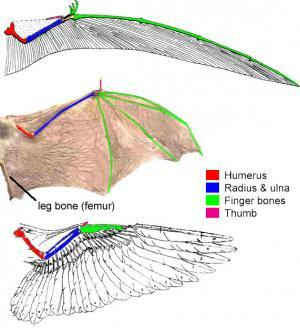 If we take a look at the way wings have developed in different vertebrate groups for instance, we see that bats have developed wings from their hands, with leathery membranes stretching between their fingers. In birds the whole arm has been modified. In Pterosaurs it is but one finger that makes up the wing, while the rest of the creature’s fingers still stick out into the air. If a bat had the need to develop feathers, which they seem to be doing okay without, the likelihood of them having all of the complex barbs and barbules of a bird’s is very unlikely. As I mentioned above, an avian wing requires an ‘arm’. For a griffin to have four legs and bird wings would be another rare thing. Although animals can be born with an irregular number of limbs, this alteration is rarely passed down through the generations, and would not likely be in a place where it can be put to use as the griffin would need (ie. a pair of legs atop its back, around the shoulder blades). Where flight has previously evolved in vertebrates, as in my three examples above, the results have been animals with two wings and two legs. It is much easier to alter a limb, than to grow a new one. The tetrapod (four-legged animals) body plan is quite limiting in this respect. Birds and mammals have restricted body plans, four limbs and then you’re almost done. Insects have developed wings without modifying their limbs, true, but their bodies are much lighter than most vertebrates, and the strength required to lift a vertebrate off the ground requires some significant muscle power and strength. In addition, the griffin’s wings are far from insect-like. They are limbs. The griffin may not be real, and might dance on the edges of plausibility, but for all that it breaks no rules of nature. In myth they are known for guarding treasure, but they wouldn’t be the only animal to ever do that (us, mainly). Even compared to dragons they are simple, for we don’t have to come up with a biological mechanism for breathing fire. Next time, we’ll tackle another creature out of myth, and shamelessly milk it for biological talking points.